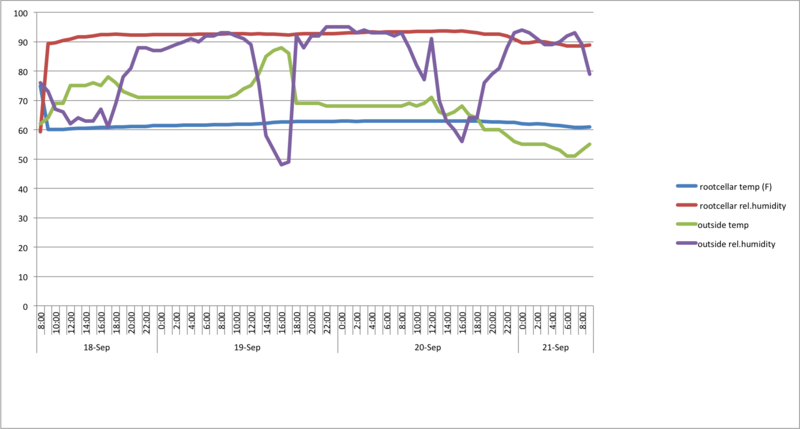 Our initial day monitoring temperature and humidity in the new root cellar showed that temp held pretty steady, and increased only a small bit relative to the outside temp. Humidity started on the high end of moderate and got higher (into the low ’90s). As luck — at least as far as early testing of desired environmental conditions goes — would have it, we had a brief warm spell on the following two days, and a lot of rain. As observed in the first day of monitoring, the conditions in the cellar were very consistent. Temperature stayed in a 3° range in the cellar while it ranged a whopping 37° outside. Relative humidity was pretty much always between 89% and 93% in the cellar, but was as low as 48% and as high as 95% outside. This is exciting – things are working as hoped. The temp. is still too high in the cellar, though near the end of this time it is starting to drop as the temp outside drops. The next step is to try to lower the temperature by getting more cold air from outside in at night. This entry was posted in Food and tagged rootcellar. Bookmark the permalink.